The journey begins for UC Merced's largest incoming class of students. More than 2,200 students — many entering their first year at UC Merced — arrived last weekend in cars, trucks and minivans packed to the gills with living essentials from clothing and toiletries to laptops and microwaves. Move-in weekend is always a bustling time on campus as parents, families and friends help their Bobcats get settled in and spend some time on the campus with them before heading home. Student and staff volunteers met and greeted new students throughout the day, helping them to move luggage, boxes, mini fridges and other items — as well as answering questions and providing directions — as they moved into the residence halls. To launch the 2017-18 academic year, incoming students gathered Aug. 22 at the recreation field and walked across the Scholars Lane Bridge and through the Beginnings sculpture — an annual tradition. 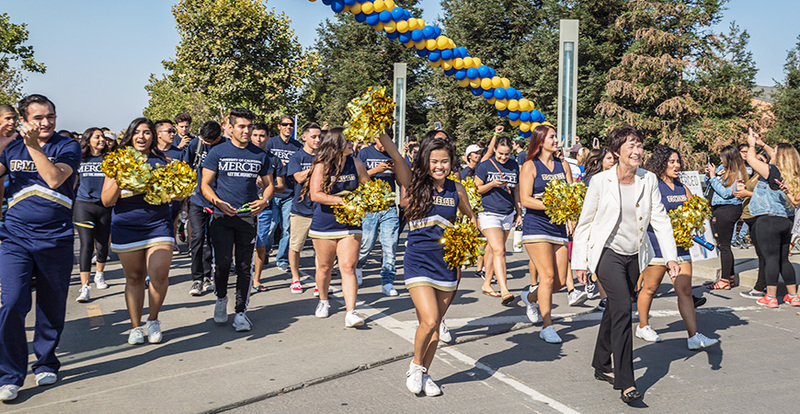 Faculty, staff and continuing students lined the bridge to welcome UC Merced’s newest Bobcats. When classes began today (Aug. 23), the campus welcomed its largest entering class of about 2,400 undergraduate students and 160 graduate students. Total enrollment is expected to be at 7,900, and will be confirmed after the third week of classes. Welcome Week activities are planned to help new and continuing students become engaged with the campus community. In addition to new students, the new semester brings other new faces around campus. Elizabeth (Betsy) Dumont joined UC Merced Aug. 1 as the third dean of the School of Natural Sciences and the second woman to serve in this capacity. Dumont comes to the campus from the University of Massachusetts, Amherst, where she was the vice provost for Academic Affairs and a professor of biology. More than 30 new ladder-rank professors joined the faculty for the 2017-18 academic year. That’s the largest single group of faculty members since the campus broke ground. The increase in faculty numbers will support growing numbers of enrolled students as the Merced 2020 Project increases the available living, learning and research space on campus. New academic programs are also planned as the campus grows. This fall, a new major is available in Critical Race and Ethnic Studies (CRES), bringing the total number to 23. The new major dovetails with UC Merced’s research emphasis on inequality, power and social justice. Looking further ahead, Family Weekend and Homecoming 2017 will take place Oct. 20-22. And by this time next year, campus will have a whole new look. Three new buildings — a dining facility and two residential/classroom facilities — will be completed and a new campus entrance will be in place as part of the Merced 2020 Project.